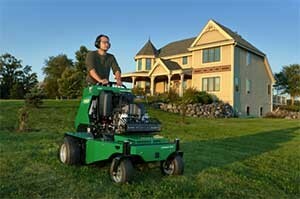 Ryan, a manufacturer of turf renovation equipment, added the new Lawnaire ZTS, the first ever stand-on aerator from Ryan. The Lawnaire ZTS includes an automatic chain-tensioning system, a shock-absorbing operator platform, intuitive drive controls, a fast hydraulic tine lift and an aeration depth stop. Additionally, multiple easy-access panels keeps out debris, the company said.